The looming specter of one’s 30th birthday can be vexing for anyone, but it’s especially troubling for the late-twentysomethings who inhabit GRAVES, a strangely charming horror-comedy webseries from creators Terence Krey and Dan Fox, who previously gave the internet the 13-episode Oh, Inverted World series. The characters in GRAVES are dealing with demons both figurative and extremely literal. As teenagers, a group of friends had some kind of serious run-in with the forces of darkness. One friend didn’t make it out alive, and the rest seem to feel some sort of supernatural survivor’s guilt. Ten years later, they are aimless, underachieving quasi-adults who don’t seem able to get away from their depressing little home town. Their jobs are jokes, they’re broke, their love lives are DOA, and they’re also plagued by snarling, horned demons. At least Jane is. She’s the series’ sardonic, directionless protagonist. Think Daria except plagued by forces beyond human reckoning. By day, Jane “works” at a local comic book shop and snarls at customers. 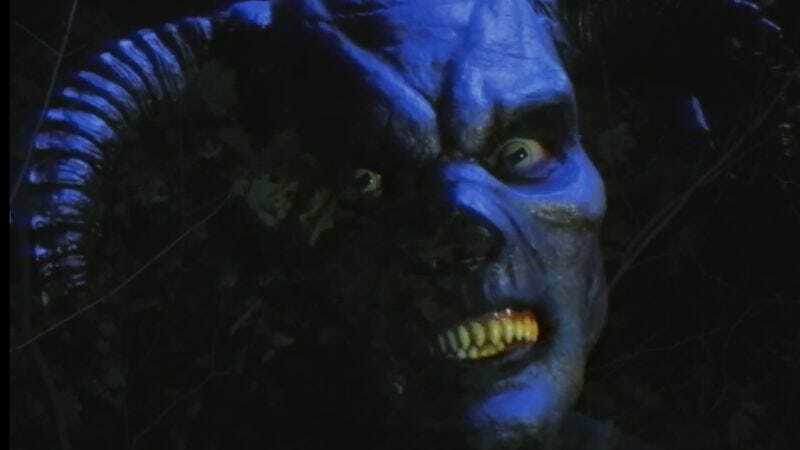 By night, she is visited by a cackling, blue-skinned creature identified in press materials as Astaroth. Don’t ask him about his full name though. Getting through that takes a while. The entire first season of the series, consisting of four bite-sized episodes (averaging around 5 to 6 minutes apiece), is available here. For those who want to sample GRAVES before digging into the episodes, a two-minute trailer has been posted to Vimeo. Viewers can also keep up with the series via Facebook. GRAVES - Season 1 Trailer from Open Casket Skeleton on Vimeo. The look of the series is proudly grainy and low-budget, giving the entire production the feel of a vintage 1990s television show that has been recorded onto a much-used VHS tape. It’s like a crossbreed of a straight-to-video horror film and an especially unnerving season of The Real World. Meanwhile, those who find puppets to be triggering should know this: GRAVES contains some disturbing puppetry. As for what it all means, the series could be viewed as a statement about how millennials want to put off actual responsibility and commitment for as long as possible and remain children forever. At least the characters in this series have a darned good reason for not making any long-term plans.